Ashland catcher Olivia Tardie swipes a tag on Central Aroostook's Annika Nicholas for the final out in the fifth inning of Monday's preliminary playoff softball game in Ashland. Nicholas was attempting to score after tagging up from third base. The Hornets won, 10-9. 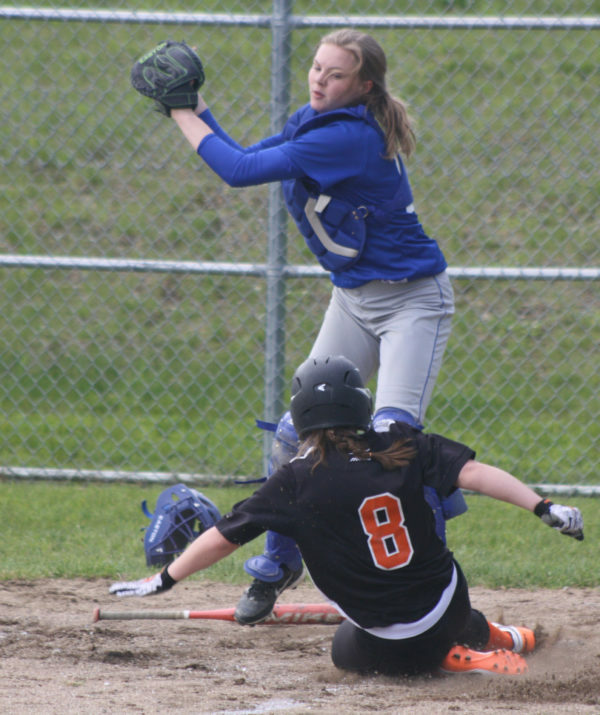 Breann Bradbury, the Central Aroostook catcher, gets ready to try to make the tag on Ashland baserunner Micayla Driscoll during the fifth inning of Monday's preliminary playoff game in Ashland. Driscoll was ruled safe and it proved to be the winning run in the Hornets' 10-9 victory. Ashland shortstop Cassidy Pelletier gets the tag down on Central Aroostook's Keara McCrum, who was attempting to steal, in the fourth inning of Monday's Class D North preliminary playoff softball game in Ashland. The Hornets defeated the Panthers, 10-9, to move into the quarterfinals on Thursday against No. 1 Southern Aroostook. ASHLAND, Maine — In a game that featured a total of 19 runs and 44 baserunners, it was a defensive play that sparked No. 8 Ashland past No. 9 Central Aroostook in Monday’s Class D North softball preliminary playoff. With the bases loaded and one out in a tie game in the top of the fifth inning, Hornet center fielder Morgan Doughty caught a deep fly ball off the bat of the Panthers’ Maci Beals. Doughty quickly started a relay to the plate to retire baserunner Annika Nicholas, who was attempting to tag up from third base. 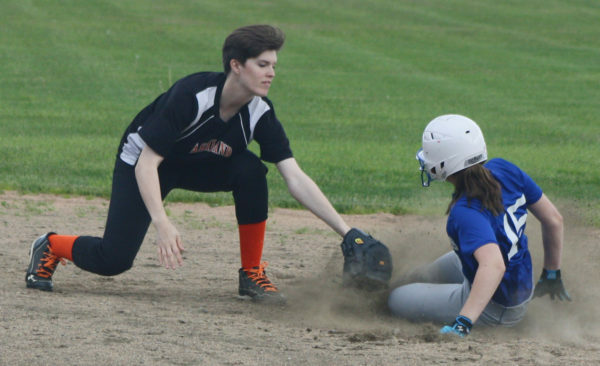 The inning-ending double play preserved the 9-9 tie and Ashland used some small ball to manufacture the go-ahead run in the bottom of the fifth, giving the hosts a 10-9 victory in the third meeting of the season between the Aroostook County rivals. Previously, each team had won on the opposing team’s home field. CA won the May 13 meeting in Ashland, 15-11, while Ashland took the second meeting on May 31 in Mars Hill, 20-1. The Hornets, now 7-8, advance to Thursday’s quarterfinal round against No. 1 Southern Aroostook, which holds a 12-2 record, including a pair of wins over Ashland. The Hornets used the momentum of the double play to rally on offense in the bottom of the inning. The No. 8 hitter, Micayla Driscoll, dropped a bunt down the third base line and used her speed to reach first without a throw. The ninth batter in the order, eighth-grader Jamie Poulin, followed with a perfect bunt single of her own in the same spot. Both players were moved along on a ground ball out and Driscoll scored the tie-breaking run on another groundout off the bat of Olivia Tardie. Ashland’s Cassidy Pelletier, who came on to pitch in relief of starter Cami Deabay with two on and nobody out in the top of the fifth, induced a fielder’s choice grounder and surrendered a walk before Beals connected on the long fly ball. Doughty backpedaled and reached up high with her glove hand to make the catch and threw the ball into shortstop Shelby Stolze, who then fired it into the catcher Tardie awaiting Nicholas at the plate. Pelletier also pitched out of jams in the sixth and seventh innings, with the game ending on a strikeout with the bases loaded. Five of Ashland’s eight hits were produced by the last three batters in the order as Hailee Cunningham, another eighth-grader, and Poulin collected two hits each. 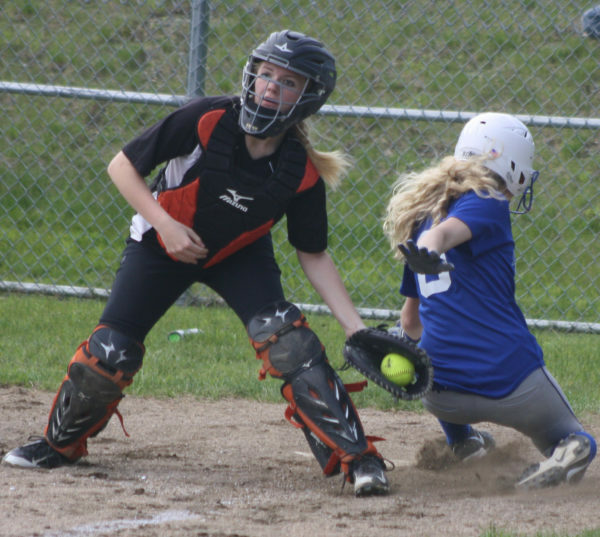 Central Aroostook (7-8) took advantage of 13 walks by Deabay to score four times in the third inning, three in the fourth and two in the fifth. Deabay and Pelletier did combine for 11 strikeouts. Macey Coffin was CA’s only repeat hitter with two singles and she drove in two runs. Panther pitcher Caitlyn Harris walked four batters and struck out two in her six innings of work.